Yeol Eum Son is a South Korean pianist who won silver at the 2009 Van Cliburn competition. She also placed or won prizes at the International Tchaikovsky Competition for Young Musicians in 1997, the Arthur Rubinstein Competition in 2005, and the Tchaikovsky Competition in 2011. She lives in Germany and studies with Arie Vardie currently, but her early training through the university level was in Korea. Yeol Eum is very much a natural concert pianist. She possesses the rare combination of technical skill, musicality, and the love of performance, of being in the moment. When she is at her best, her playing sounds "fresh" or spontaneous but at the same time completely under control. Her performances rarely spill over the structural framework of the music she is playing; she is more than the typical barn-storming whirlwind pianist. Even when she is milking some melodic line in a piece, she holds the other voices or accompanying parts in her mind simultanesouly. Her preference in repertoire seems to be extroverted music with many interesting ideas working in quick succession (she may get bored easily--I would love to hear her run through the major Beethoven variation sets). Many of the choices in her Cliburn disc and in her Internet videos have a "carnivalesque" quality to them. When she was featured on this Israeli television program, she performed a transcription of the scherzo movement of Tchaikovsky's Pathetique symphony, a 20th century ragtime reworking of Chopin, and another unidentified piece involving audience participation and whistling with an oom-pah jazz ryhthm in the left hand. The Haydn Sonata is excellent. The first movement contains crisp fingerwork within a sparse, skeletal variation structure. 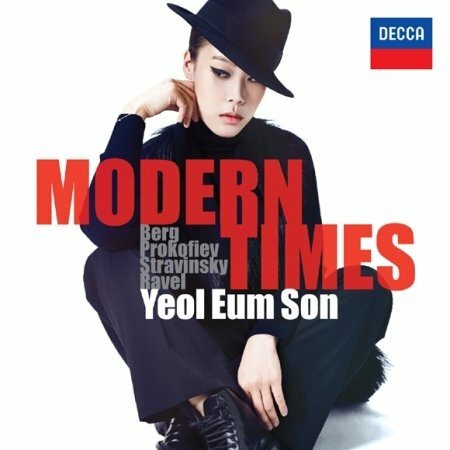 Yeol Eum seems to relish the change of scenery every six or twelve measures (not sure what the time signature is). The second movement is a halting allegro with some very pianistically effective passages that Yeol Eum digs into with sharp technical precision. The Barber Sonata is an interesting work in many ways, but ultimately in my opinion a somewhat flat composition. The sonata consists of four rather unconnected movements, which may have been why Yeol Eum chose it. The first movement is a very Scriabin-esque monolith with contrasting themes of crashing, dotted octaves and a mystical two-bar right hand leitmotif interspersed with disjointed and fragmentary dappling in the upper register. Yeol Eum's version is quite dark, emphasizing the drama and intensity of the octave dominant sections and the foreboding of the sections carrying the leitmotif. Some of the polyphony in her version is lost. The short scherzo-like second movement is also weighed down to some degree here, although it could be argued that Yeol Eum's approach tries for a consistent point of view through the work. The third movement--a slowly building adagio with a plodding, almost despondent bass line and several short themes weaving in and out of each other--works fairly well here: the plaintive nature of the movement lends itself to an emotional interpretation. When the drunken lurching of the piece snowballs to a spray of multiple-octave blocked chords, Yeol Eum is not shy about destroying the piano. She is not one to waste a good climax. The final movement is designated a fugue, and remains true to that designation for about a minute and a half before wandering off into increasingly capricious, and increasingly pyrotechnic, textures and modes. 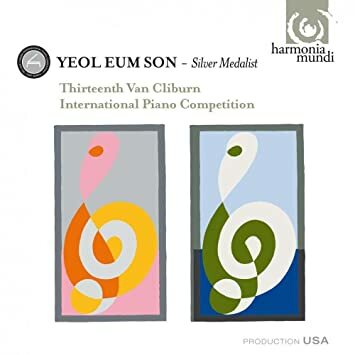 At about the 3 1/2 minute mark, it becomes obvious that compositional structure for Yeol Eum is not quite as important as the opportunity to shoot flames out of the back end of the Steinway. For balance, Yeol Eum performed all of Chopin's Op. 25 Etudes at the Rubinstein Competition in 2005 here. These are wonderfully controlled, wonderfully expressive readings that show a very capable serious side to Yeol Eum as a pianist. Seeking to get past her on-stage personality, JoongAng Sunday insisted on interviewing pianist Son Yeol-eum at her home in Wonju, Gangwon. Fans have seen Son's performances for years, but visiting her in her own space seemed like a good way to get beyond the fanfare. Son was taking a break after collaborating with the Mariinksy Theater Orchestra led by world-famous conductor Valery Gergiev on Nov. 30, and due to the cancellation of a Shanghai performance, she had a brief holiday to spend at home. The 26-year-old politely offered tea at the start of the interview, and though she began with innocuous topics like the weather, she quickly opened up about her personal life. "I was born to play music", she said simply. On stage, she has no fear ("a gift", she explained). Son isn't much fazed by public criticism either, and so she has many of the qualities required of a world-famous performer: a thick skin, confidence on stage, and as she later discussed, a love of travel. Q. How did you meet with Valery Gergiev, and was the first encounter memorable? A. I met him two years ago when he was one of the judges at the International Tchaikovsky Competition. He is a very busy person, and so we were not able to have a long conversation on the day of competition. In fact, several musicians and I actually started the gala rehearsal only an hour before the actual performance. How did you know that you would be working with him for the first time, and did you get any comments from him after the first collaboration? The organizer of the competition contacted my manager in Japan, and I heard that he wanted to see me soon. He said, "You were great, let's meet often", but things came together at the last minute. The performance was at 8 p.m., and we only managed to start the rehearsal at 7:40 p.m. We could practice for only about 15 minutes. Are you okay with such last-minute rehearsals and performances? In fact, I think this is more fun as long as the conductor can lead us easily. Some people ask me if I practice a lot. But actually, I'm not that diligent. I get the most energy when the concert is just around the corner, and so I usually begin a week before, though it really depends. For the upcoming concert with modern songs, I started practicing earlier than usual. I'm a bit lazy, so I don't immediately sit in front of the piano. I study the music first and then start playing. Can you say that this is your own way of practicing? Yes, I believe so. I spend a lot of time thinking of my own techniques because I hate doing things about which I'm not totally comfortable or confident. That's why I always learn things 100 percent before putting something into action. How often do you listen to music? Do you worry that you might lose your musical individuality by listening to others? I listen to music a lot - more than you can probably imagine. Mozart is my favorite. I love the variety of his music because there's always something to learn from his pieces. Glenn Gould's "Goldberg" Variations are of high quality but rather unmusical. Gilles has passion, and Horowitz has the ability to appeal to the audience. Rubinstein is like a middle-aged gentleman who pats little children and says, "You don't know a thing about music, kiddo". I believe you're only in danger of losing your individuality by listening to others if you don't have your own musical identity in the first place. Do you watch recordings of yourself? What has been your most memorable performance? Yes, I actually find it fun. I change my motions after reviewing if they seem to be disturbing the music. I think my most memorable performance must be playing Rachmaninoff's music with the Suwon Philharmonic Orchestra at the Seoul Arts Center two years ago. It was a two-day performance: I did not give a satisfying performance on the first day, and I was happy that it worked better the following day. I don't usually feel satisfied after my performances. I aim to appeal to the audience, and so if the audience likes what I do, I call it a success. It also needs to be a good performance overall. There is a lot of positive feedback about your concerts. How do you feel about that? I'm honored to be recognized by people I admire, but I'm harder on myself. I heard good reviews about my collaboration with the Mariinsky Orchestra and was told that I had improved from the previous year. But I didn't really agree since I liked some other performances more. How did you find out that you were musically talented? After I entered Korea National University of Arts, I realized that I could read and memorize notes faster than other students. I didn't talk much about this, though, fearing that my friends might get jealous. Are you planning to participate in another competition? No. I love being tested and criticized in front of people, but the Tchaikovsky competition was enough. I am currently in the doctoral program at the University of Music, Drama and Media Hanover [in Germany] and will focus on studying music. Does the school treat you differently than other students? A teacher told me that I was introduced on the school's bulletin board, but most probably don't even know that I study there. I travel a lot, and there are many good students in Germany who just don't participate in competitions. Do you have any regrets about studying abroad a little later than most students? Not now, but when I first went abroad, I wished I had started a year earlier. Students there did not only play music, they even played sports. I enjoyed college life back in Korea by drinking and getting along with friends, but I guess I didn't really play sports. I also saw students in Germany playing jazz freely. Not all of them were great, but it's a good way to broaden your perspective. In fact, I've also started learning jazz. I take lessons whenever I come to Korea. Korean pianist Yeol Eum Son plays Cliburn piano commissions from Bernstein, Barber, Copland, Bolcom and other composers. One of the lesser-known facts about the Van Cliburn International Piano Competition is that they commission a substantial American composer to write a new piece for each event. This piece is required of the competitors in the semi-final round. They don't see it until a couple of months before they the contest. This serves a dual purpose. First, it demonstrates the pianist's ability to learn a completely new piece in a short time period. Secondly, it adds new pieces by American composers to the solo piano repertoire. On Wednesday, the Van Cliburn Foundation presented seven of the 10 works that had been commissioned between 1969 and 1997, played in chronological order. The pianist for the evening was the silver medal winner of the 13th Cliburn (2009) and, by the way, also the silver medal winner in the XVI Tchaikovsky International Music Competition in Moscow: Korean pianist Yeol Eum Son. In a recent interview, she explained that her name is really just two names, not three as it appears in writing. Yeol Eum, her given name, is really one word, but it consists of two characters in Korean. She searched a bit to translate Yeol Eum, but settled on "bearing fruit" or maybe "fruitful." Son is her family name. Fruitful certainly describes her playing. She plays as naturally as an apple tree bears apples. She sits tall at the keyboard and moves her hands very slowly to get into position before she starts. This almost Zen-like movement also occurs during pauses in the music and in a more exaggerated way at the end. The audience sits frozen in silence while she slowly withdraws her hands from the keyboard. Finally, she appears to collapse backwards, and then we know the piece is finished and the spell is broken. Shields-Collins Bray, a stalwart at Cliburn events, narrated by offering short commentary before the first three selections and then again before the last group. He was also part of the group that chose the pieces that would be on the program. Son didn't have any input. "Buddy [Bray's nickname] knows how I play and my abilities, so I knew he would pick pieces that would be a fit for me," Son said. Unlike other Cliburn events that are almost exclusively in Fort Worth, this concert was in the Horchow Auditorium in the Dallas Museum of Art. The place was packed, and while this may have been due somewhat to the fact the concert was free, you could tell that the capacity audience knew pianists and piano repertoire. They gave Son a rousing and well-deserved ovation after individual works and again at the end. Son gave an impressive account of all seven pieces. They were: Dello Joio, "Cappriccio on the Interval of a Second" (1969); Copland, "Night Thoughts" (1973); Barber, "Ballade" (1977); Bernstein, "Touches" (1981); Corigliano, "Fantasia on an Ostinato" (1985); Schuman, "Chester: Variations for Piano" (1989); and Bolcom, "Nine Bagatelles" (1997). What is most interesting about this list is how few of these works have actually made it into the repertoire. To the best of my knowledge, only the Corigliano is programmed regularly. It was also Son's favorite. "I plan to add the Corigliano to my repertoire," she said. "Maybe the Barber." She didn't have much time to learn the program since she is playing a lot of concerts these days. "None of them were really hard in a transcendental way, but all are difficult. They all fit in the fingers, which really helps. The Bolcom and the Schuman have lots of fast passages. So they are tricky to learn and risky to play. But, I liked them all." That is more than I can say. Personally, I was surprised at the mediocrity of the commissioned works. Mind you, we are talking about the mediocrity of the greatest composers, which is still very good. Even the much-lauded Corigliano wears after a while as it continually bangs out its patterns on a single note. The Copland dates from a time near the end of his life when he was feeling old fashioned and that he needed to write in a more dissonant style to keep current. Hearing it, you would never guess who wrote it. The same situation occurred with the Barber. He was a neo-romantic composer whose works, when he wrote what he really wanted to write like in the Violin Concerto and the operas, reaches sublime levels. Here, like Copland, he is trying to duck the slings and arrows of the modernists who constantly belittled him. While it still sounds like Barber, it is wearing an ill-fitted harmonic suit. William Schuman, an unjustly ignored composer if there ever was one, took the prize for me with this set of variations on the Revolutionary War marching song "Chester." He used this tune in other works as well. Here, he puts the Chester through it paces in a highly intelligent way. Bernstein's "Touches" is typical of his eclectic style with a grab bag of influences from wild dissonance to jazzy riffs. Bolcom's "Bagatelles" where pleasant to hear but, try as I may, I can't remember much about them now. I have much the same reaction to Dello Joio's piece that opened the program. Son was simply magnificent. She called the program a "wide collection of musical styles" and that was a perfect description of the concert. She changed her approach with each work to bring out the composer's intentions with clarity. Even though the pieces had much in common, (sudden changes, sectional structures, fast mood shifts, wide leaps) they all sounded completely different in her able hands. She ran the gamut of dynamics from surprisingly forceful to barely audible and the fast parts were delivered with crystalline clarity. I only regret that we didn't get to hear the other three commissions. 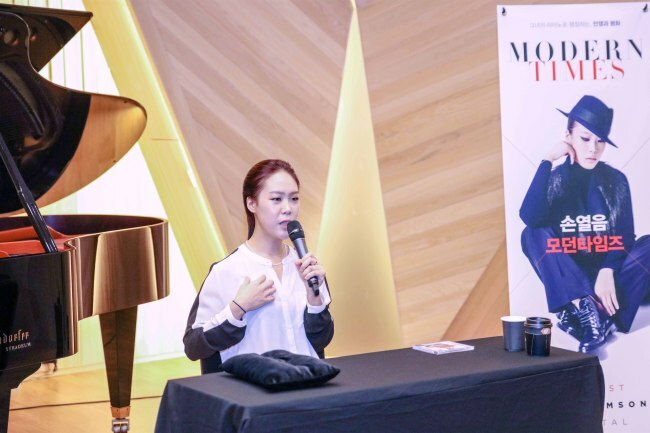 Classical pianist Son Yeol-eum has returned to the limelight with her first album in eight years, “Modern Times.” It features a wide range of music from jazzy razzmatazz swing tunes to sounds that remind listeners of a dark and desolate night. “This musical theme is something I have always wanted to pursue because I think this style of music represents such important and influential times in our history,” said Son, during a press conference held at the Stradeum concert hall in Seoul on Wednesday. “All of the music selected from the album are from the early 20th century, an era in which I think saw a big shift in both world history and music culture,” she added. The album is a far cry from other recent releases by her local pianist peers such as Cho Seong-jin, Lim Dong-hyek and Dasol Kim, which have all tended to err on the side of traditional classical pieces from Chopin to Schumann. “We are now living in the 21st Century, and it has been 100 years since these pieces were written,” Son explained. “During this era I think the world has really opened up and there has been some drastic changes in the sounds of classical music … in the process of making this album, I found myself thinking about how much change happened in both the East and the West during the World Wars,” she said, adding that the seismic shift in the world’s cultural and historical climate allowed for the birth of a new generation of classical music repertories. 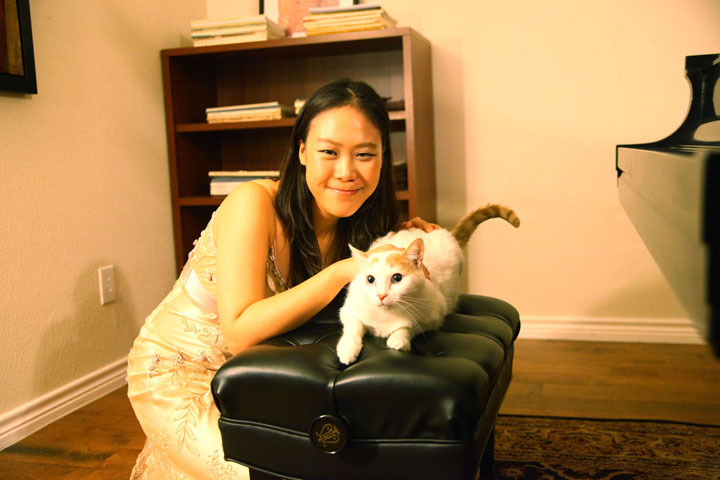 Son, who is from Wonju in Gangwon Province, first drew international attention when she appeared as a soloist with the New York Philharmonic Orchestra in 2004 under the baton of conductor Lorin Maazel. Awards that she has received include the Silver Medal at the International Tchaikovsky Competition 2011, in which she also received awards for the Best Chamber Concerto Performances and the Best Performance for Commissioned Work. Son will soon be performing her modern-day tunes across the country from Feb. 27 to March 7. The pianist will kick off her tour with a solo recital performance at Seoul Arts Center’s Concert Hall – her first recital in three years – on Feb. 27. Tickets prices range from 30,000 to 80,000 won. Following her Seoul performance, Son will also hold concerts in Gangdong, Daejeon, Changwon, Gunpo, Daegu, Ulsan, Yeosu, Busan and Seongnam.